Picking a team; coaching players; tactical awareness; motivational speeches; scouting missions; cajoling footballers to perform to the best of their abilities. The lengths a football manager goes to make their football team the best often has no bounds – even more so in this day and age. 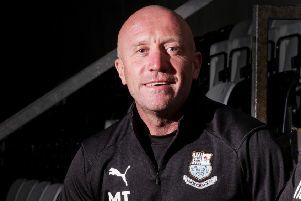 For a part-time football manager like Mark Fell, there are often not enough hours in a day as he tries to combines his full-time job as a senior teaching consultant in further education with his role as the boss of NPL Premier Division side Lancaster City. There is not much time to rest when you’re looking to give your team that extra edge come Saturday afternoon. Indeed when Fell does find time to sit down and have a brew, he often finds himself trawling through Twitter and other social media forms on his phone, looking for that snippet of information which could give City an advantage – whether that maybe signing a new player or learning of an injury to someone on the opposition. “That’s my job as Lancaster City manager,” said Fell, who lives in the city. “It’s my job to be alert and alive to everything that potentially could happen. “For example you have to be so proactive when it comes to securing new players as and when they may be available. “Myself and my staff do a lot of that. “We almost have to be social media addicts. “You have to see things and take note of players’ comments. “Check whether they are happy or unhappy where they are at. “As a football manager you have be an opportunist. “Good managers have to be opportunists. “People talk about the dark arts in terms of players managing games, drawing fouls, gamesmanship, but as a manager you have got to be good at the darks arts in signing players. Such is Fell’s ambition in football, one day he would love to work as a full-time manager higher up the football pyramid – even the Football League. 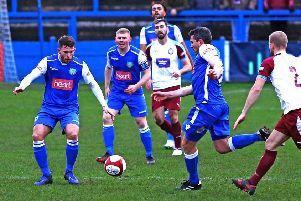 “That is where I want to go,” said Fell, who has also managed Ramsbottom United and Nelson in the past. “I want to be a full-time football manager or work in the game full time in some capacity. “I have turned down a couple of chances to do that in terms of youth jobs. “Ultimately, I want to work in the game full time and as high as possible. “Obviously, at this moment, I am busy because I work in education and that’s tough when you’re also a football manager. “But you do it because it’s a labour of love and something which you have a real passion for. “You do miss it when you’re not involved. “I did have a bit of time out of the game in between my jobs at Nelson and Ramsbottom and you do miss it. Talking of things which Fell enjoys, as well as his love of the beautiful game, he’s also mad keen motor sport enthusiast. So much so that when he was younger he looked into the possibility of making a name for himself as a racing driver. Brought up in a motorsport-loving family – his dad Malcolm was a successful rally driver and runs the international kart track at Rowrah in Cumbria. “It was my life as well up until my early 20s. “I sorted of run it at the side of football when I was playing. “I do still have a lot of friends in motorsport and I still do a little bit of work. “I was doing some commentary for an international kart race recently and other bits and pieces. “But I haven’t got the time for it anymore. “To be honest, it’s almost like a previous life now because I’m that wrapped up in what I’m doing now. “But I was quite successful. I won four or five British Kart Championships. I won a couple touring car races both here and abroad when I had a little go at it full-time. “I did a lot international races. I spent a lot of time out in the Middle East doing endurance Le Man-type races. “Ultimately though unless you have significant backing – a couple of million quid in the bank really – you’re not going to progress. “There is a back story to every Formula One driver where they have had a significant amount of investment. “From my perspective it was never going to be for me. “I had a little bit of success when I had a go at it full-time from a karting perspective and I also had a little bit of success in cars. While all that is most definitely in the past, the future is very much about the Dolly Blues for Fell. Since taking over at Giant Axe with the club rock bottom of the NPL Premier Division, he has battled hard to navigate the club away from danger. “We are doing alright,” said Fell, who prepares his team to face title challengers Farsley Celtic this afternoon. “Our away record is very good. We probably need to do better at home. Despite the stress of City’s present precarious position, the 36-year-old insists he has loved every minute so far of his time at the club. It is his ambition to secure safety this season and then look to move up the football pyramid over the coming years. “I’ve enjoyed it and sometimes you forget that there should be an enjoyment element to it,” he said. “I want us to be safe as quickly as we can be and then I can get my teeth into making us better. “I said this when I first took the job – I always remember the Boxing Day game in the Conference North was Lancaster versus Barrow.